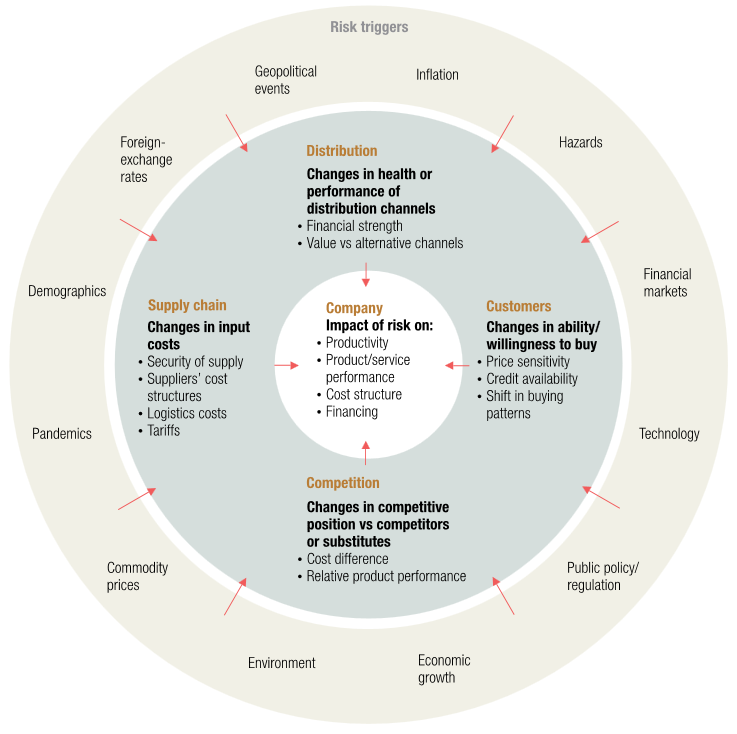 In October 2009, McKinsey Quarterly published an article with the intriguing title “Risk: Seeing around the corners.”McKinsey Quarterly | It was written by Eric Lamarre and Martin Pergler. A few months earlier, the world was convulsed by the financial crisis, so the title that accompanied the graphic below — “Companies are susceptible to interconnected cascades of risk” — seemed obvious. The article was written for the leaders of companies, so the risk triggers identified are oriented to the bottom line of company operations. That framework could just as readily be used by a fundamental analyst at an asset management firm who is trying to anticipate the affects of various risks on the companies she covers. The listed risks are all over the place: some slow-moving, others that can show up overnight. Depending on the business models in question, they could be negligible in potential impact for one firm and devastating for another. And, the list is not complete (it never is). How are risks identified and evaluated? For investors, “risk management” has come to mean a backward-looking, statistical exercise overwhelmingly driven by historical standard deviations. True risk management includes that (along with more expansive quantitative techniques), but it absolutely must be coupled with a forward-looking, qualitative approach. A concerted attempt to “see around the corners,” if you will. That involves creativity. Anyone can sight and recite the risks most recently endured. Those lessons should not be ignored; but don’t worry, they won’t be. The emotional scars are such that we will remember the specific risks that caused our most recent trauma for a long time (and they will be overemphasized in our analyses for years). So, an analyst needs to be constantly on the lookout for emerging risks at companies while trying to properly assess the ones that have already been identified. Another level of risk evaluation comes into play at the portfolio level, starting with the particular collection of securities and how they are expected to behave in the context of “normal” markets. These days, you can push a button and get a long list of metrics to describe the portfolio (although, as mentioned before, standard deviation dominates the analyses) to accomplish that. In addition, there are a range of risk triggers not unlike those shown in the graphic above which determine the pricing of securities over time and the behavior of the market itself. Stocks and bonds have had a long run (to historically high valuation levels), so perhaps a greater focus on identifying and valuing risks should be a high priority now. But a different kind of risk — career risk — helps to ensure that not too many people will step out of line with the current way of thinking, even if they see particular risks looming. Unless and until something breaks and downside possibilities seem more real, the examination is less urgent and easily given little attention. Another dimension of risk is that faced by the leaders of an asset management firm, quite apart from the investment concerns of how a particular company is doing, or a set of securities, or the market as a whole. A lot of things can go wrong operationally. There is a whole network of responsibilities to be executed. Depending on the type and size of firm, they can be done in house or outsourced. In many cases, an asset manager is first in a line of many agents that are working on behalf of the owner of the assets. It’s hard to keep track of the potential risks that come into play, to say nothing of really understanding the ability of any part of the network to function as anticipated. 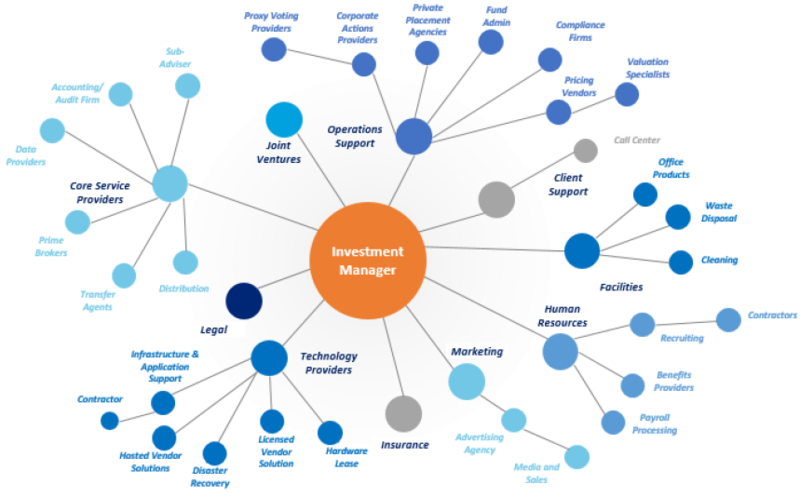 Notice that one important node does not appear in the graphic: those outsiders that feed the investment process, especially analysts at brokerage firms, independent research shops, consultancies, expert networks (speaking of risks), etc. As even this high-level picture shows, there are a lot of potential nooks and crannies in the system. In the technology area alone, the number of vendors can be staggering. On top of everything, we are in a time of great change in the investment ecosystem. Asset management, a very profitable, relatively stable endeavor, is facing disruptive forces that are stronger than we’ve seen since the industry really got rolling forty years ago. The pieces of the puzzle might need to be put together in new ways to be successful.The Investment Ecosystem™ | That’s the theme of my upcoming paper. Sign up here to receive it. These different circles of risk — containing the factors that affect the issuer of a security, the structure of a portfolio, the performance of the market, and the operation of an asset management business — intersect with each other. And amplify each other during times of stress in ways that are often unanticipated. Making the extra effort to recognize them and prepare for their potential escalation into matters of concern is time consuming and can seem unnecessary. Until it pays off.